My new favourite bag at the moment is the L.L Bean Canvas Tote, this old school functional durable tote bag is a perfect everyday shopping, gym, gardening or even the beach. Practical reasonably priced classic = top marks from me! 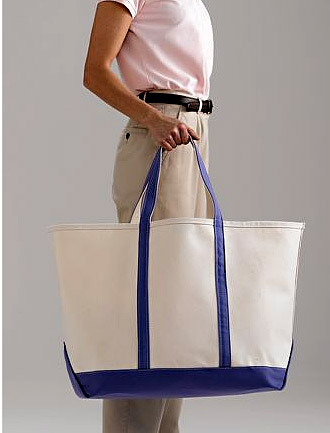 My favourite of the array of colours is the Cornwall blue open top cotton canvas with the signature double layer base and handles, perfect for my summer ahead, and big enough for all of my bag junk that I tend to hoard. Reese Witherspoon spotted with her customised L.L Bean Small Tote.